The Traveler-mk3 from MOTU can function as both a FireWire audio interface or stand-alone mixer, and is primarily engineered for high-end mobile recording applications. Equally suited to any other audio situation, the unit delivers 4 high quality microphone inputs, and can be powered from either a computer's FireWire bus or via optional battery packs. It also features internal DSP-driven mixing and effects processing. As an interface or stand-alone mixer, the Traveler-mk3 provides 28 separate inputs and 30 separate outputs, including 4 combo microphone/instrument analog inputs equipped with pre-amps, individual 48V phantom power switches and Digital Precision Trim controls adjustable from the front panel or CueMix FX software. DSP effects include a 60-second reverb, 7-band parametric EQ and various flavors of compression/limiting. 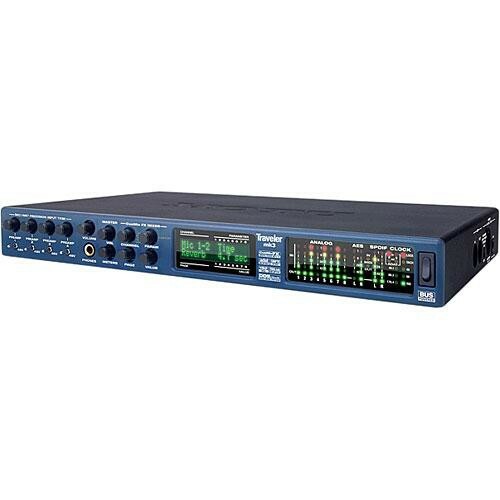 Box Dimensions (LxWxH) 19.0 x 12.9 x 5.4"
Traveler-mk3 - FireWire Audio Interface is rated 4.7 out of 5 by 3. Rated 5 out of 5 by Goose from Plan to buy a 2nd Traveler-mk3 for my so I am very happy. The features of on board DSP with great sounding effects and stand alone operation have me using the Traveler in more applications than my old hardware. Fits in my laptop bag so I can sneak it into work and get payed to play. Rated 4 out of 5 by video traveller from light and fast I'm using this product to record voice overs on location mainly, occasionally recording live musicians. It works just great. Pretty light too.